This incredibly inventive and fun motion graphics technique will give your action sequences a delightful and exciting twist. One of the classic animation effects you’ve seen dozens, if not hundreds of times, is anime speed lines. This effect is simple and effective at focusing attention on your subject. If you’re not familiar with the effect, it’s basically animated lines focused on an object in the frame. It’s simply a way to demonstrate the excitement felt by your characters, letting the audience know what to look at. Jason Boone from PremiumBeat recently created a tutorial on how to do this in After Effects. Let’s hop in. First things first, we’re going to draw the shape of lines you want. With this example, Boone draws a triangle using the pen tool. Once you’ve done this, you’ll want to angle the triangle towards the center of your frame. Or, if the object you want to focus on is in the top right, bottom right, etc, you’ll want to have it angled in that direction. Make sure to use Rulers and Guides to set the vertices exactly as you need them to be. Using the Pan Behind tool, set the shapes anchor point to the focus point of the image. In this case, it will be the center of the frame. Once you’ve drawn up your first line, its time to make several of them. Click the Add button, and then hit Repeater. Place the Repeater under the shape group. Now you’re going create multiple lines (shapes) so go down to Transform Repeater 1. Change the X Position from 100 to 0, then go up and set the Copies number to 20. Then once you’ve done this, play with the rotation. You’ll see it will spin your shapes around your Anchor Point. Next, we’re going to want to position the shapes in the right spot on the frame, so move the speed lines over your subjects face or whatever you want to be focused on. You can do this by using the main position attribute of the shape layer. To spread the lines out, go back to the Transform option and spread out the Y position. To adjust the overall size of the circle, adjust the shape layer. You’ll want to do this if you’re trying to fill out the entire frame. In order to create an appealing-looking animation, the speed at which the lines animate must match the speed of your zoom. Did I mention there’s usually a zoom involved? So, whatever the camera focuses on, the animations and zoom will move in sync towards the subject. 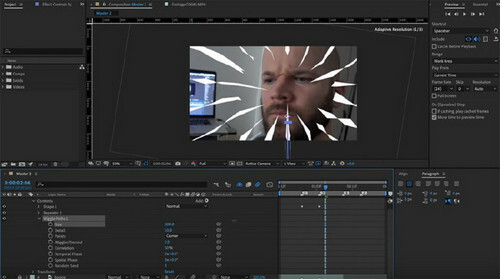 Add keyframes to the Y position of the lines shape element so that it starts and ends around the same time as the zoom. Smooth the animation out even more with Easy Ease. It might take a few tries to match it correctly, but it’ll be worth it. Anime lines can yield mind-blowing results. Evidence of this can be found in Corridor’s insane short film that they released a few months back. Enjoy!